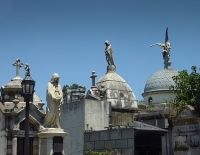 An unlikely tourist attraction, La Recoleta Cemetery is well worth visiting to see its magnificent display of monuments and the ostentatious tombs of Argentina's rich and famous. The cemetery is the second largest in the world, covering more than five hectares and filled with more than 4,700 vaults. Due to its size, the cemetery is divided into several big blocks with avenues between them, making navigation in the enormous space a little easier. Each vault has the family name carved over its entrance, while a collection of brass plaques next to the entrance displays the names of all the family members buried inside the vault. One of the more modest, but by far the most celebrated, is the grave of Eva Peron. Every day thousands of visitors come to leave flowers at the door of the Duarte family mausoleum where she is buried. Forty years on, Evita remains both the most revered and reviled figure in Argentina. Love her or loathe her, her spirit lives on in La Recoleta. In addition to Evita, another famous cemetery inhabitant is the supposed daughter of Earl Alexander Walewski, Isabel, who died in Buenos Aires when just a baby. The superstitious say that on some nights, you can hear the baby crying from her godmother's arms. Opening times: Open daily. Guided tours are available.